GameStop has announced a new deal where PS4 purchasers will receive a complimentary PlayStation TV mini-console along with a one-year subscription to PlayStation Plus. It might be safe to say to, at this point, that the PlayStation TV has been kind of a bust for Sony. Granted, some would probably argue the same thing about the PlayStation Vita, but at least that thing has its fans. The PS TV, perhaps thanks to its considerably limited functionality, has struggled to find an audience from the get-go and represented only a small fraction of the company's hardware sales in 2014. Responding to its lack of consumer traction, several retailers last year dropped their prices on the mini-console from $100 to $80. Taking a substantial step further down discount road, it would now seem that some retailers have decided to just go ahead and give the PS TV away for (almost) free. 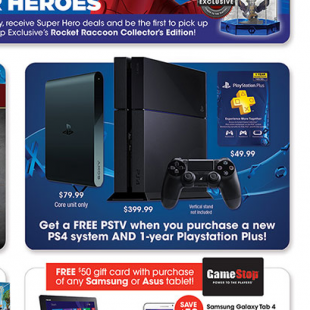 In a recently released flyer, GameStop revealed a new deal offering prospective PS4 purchasers a free PS TV unit when they buy a new PlayStation 4 with a one year subscription to PlayStation Plus. While we've yet to see any other retailers following suit, it honestly doesn't strike us as a bad idea. Just speaking personally, while I enjoy my PlayStation TV, it still feels very much like an add-on for my PS4. It lets me play games with my wife near her computer desk while still leaving my main console downstairs and that's about it. That sort of unnecessary convenience might not be enough of a selling point for some, but the prospect of getting it for free could serve as a decent incentive to buy a PS4. GameStop is essentially taking something that might otherwise just sit on a shelf and transforming it into a commodity. *Headdesk* of course this happens AFTER I buy one. Go figure. Same thing happened to me with Mass Effect. Bought an Xbox 360 for the sole purpose of playing the Mass Effect games. Three days later it gets announced for PS3. *sigh* Look, I like the idea of the PS TV, but man, does it need an update for compatible games. At the moment I'm only able to play three games from my Vita library. If Sony had taken the compability seriously they'd be able to market the device to an additional target audience. Instead they chose to focus on the streaming gimmick. Such a shame, the VITA games that are working look really good on the big screen. "The deal also includes a complimentary one-year subscription to Sony's PlayStation Plus service, which is a pretty nice bonus on its own." Try reading. It says when you BUY both, meaning $450. C'mon. This is what Sony themselves should have done months ago (like during that small shopping season that falls around mid-November to late December). Even if the bundles were $40 more than the basic PS3 price, it might have helped sell some more Vita games or more PS+ subscriptions. All they had to do was add an up to date leaflet advertising all the PSTV compatible Vita games and what PS+ has to offer for PSTV owners and a 4GB card. (We know the cards cost jack to make so 4GB should be included in every SKU to begin with.) With this kind of bundle, I'd bet some people might even give the PSTV to a relative, who might have bought their own PS+ subscription. Sony should do this now or cut the price of the PSTV nearly in half. They really do treat it less as a Vita without touch surface and more like a PS4 accessory, and $80 to use your PS4 in another room without unplugging two cords is too high of an asking price. What they should have done in the beginning. The gimmick on its own is clearly not strong enough not to mention more people prefer Vita if they want that sort of performer. Pairing it up with the champ is going to give a rub even if PSTV will be taking any and all pins in the tag matches against the Nintendo family. I think it'll be a PSP-GO situation where the guy gets dropped for jobbing too much, and than makes a return and squashes his replacement to show renewed aggression. Still even with a new found ruthless aggression everyone knows Vita will job to 3DS again regardless. The only thing keeping me from running off to the nearest Gamestop right now is that I've been following a strict rule to never ever purchase 1st-generation hardware from Sony. After a dead PS1, PS2, PS3 and PSP (all first-generation models), I absolutely refuse to get a PS4 until the next model comes out. It's worked with my Vita so far.